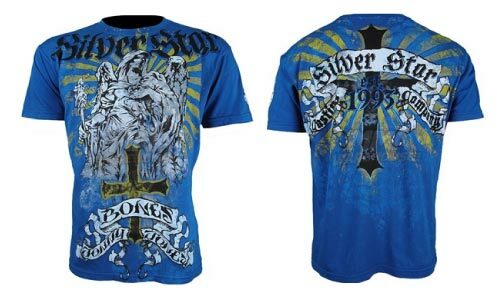 Silver Star has rolled out a limited edition Blue Jon Jones Shirt. It is the his signature “Radiance” MMA T shirt that he wore in his victory over Brandon Vera in the first ever UFC on Versus event. The Blue Jon Jones T shirt features a sunburst pattern that has graphics to mimic rays of sunlight. In the foreground, is a display of Christian symbols of a cross and an angel. The back of the shirt is much more bold, with a bigger cross and the sunburst pattern with greater intensity. 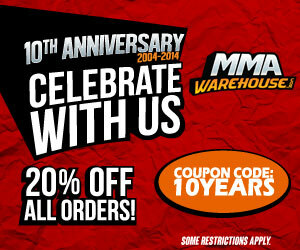 ***There are only 150 of the Blue Jon Jones Shirts available, get one before they are sold out!! !